It’s getting close to the “offseason” for many outdoor activities. Or, at least, the shorter days and holiday business tends to reduce our enjoyment of some of these things. It also happens to be a good time to take care of any maintenance you might need to take care of. Several years ago, I made use of the winter offseason to sew a couple of down quilts. 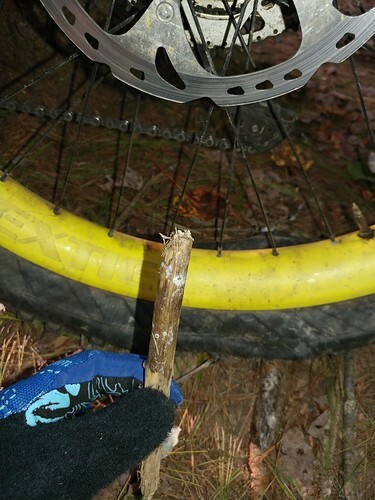 I’ve been working on a master’s degree the past few years and so I haven’t had much time for winter gear projects, but I did give the shocks on my mountain bike some maintenance a couple years ago. I wish I could stake a claim on that word, but I can’t. I have no idea who came up with it, but I’ve been seeing it around lately. The short of it is that Strava’s segments competitions are pretty popular in some places. That popularity coupled with some people’s single-minded drive to compete is causing some problems out there. Other sharing sites are taking note. Garmin Connect introduced running Personal Records earlier in the summer and just added the functionality for cycling at the end of August. After my ride in Indy and the mechanical I suffered (being the second time I had that particular problem recently), I decided I needed to replace some worn parts…particularly my 9 yr old XTR M952 rear derailleur. It still “works”, but I’ve had to bend the cage twice recently. It’s on its last legs, I believe. 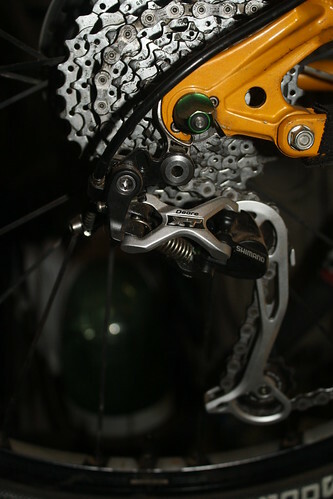 The Bike Shop in Nac had a NOS XT Shadow M772 rear derailleur in stock. Not sure how old, exactly, but it’s probably been on the shelf for 5yrs or so. I negotiated a deal for it with the owner and went home to install it. I got to ride these trails for the first time recently, though they’ve been open for a few years now, I think. I grew up just a couple miles from here and wish these trails were open when I started to mtb. Alas, they were closed to bikes long before I started riding. Yay for them being open now. The Hoosier Mountain Bike Association has done a great job with these trails. I recorded my ride with my Oregon for posting on Strava. My GoPro HD Hero arrived today and I got to take a couple minutes of video before it got too dark. I used it on the default settings, which are for 960p HD…essentially a tall HD format. I tried out the chesty mount first because it was the easiest to set up. It is pretty clever. I have quite an assortment of mounts I can use, and I’ll be playing with a couple of them tomorrow when I hit the trails with some buddies. It took me awhile to get my first ride of 2011 in. No excuses here. I was lazy for the first couple weeks of January, but we’ve also had rain moving through the area on a regular basis since the New Year. We’ll only get a day or two of dry, sunny weather, and up until now, those days have coincided with days I’ve had other stuff to do. Today, I had time to ride, so I took advantage of the nice weather. I got an air compressor (well, a gift card for one – because we weren’t going to haul one 2,000 miles with us on our trip to visit family for the holidays) from my wife for Christmas. I ended up choosing a portable Kobalt compressor for my uses, since I mostly just want it for inflating tires (car and bike) and for the occasional other random use (like installing/removing grips and for blowing dirt out of my drivetrain). The inflator and hose that come with the Kobalt compressor are pretty lame, though. There’s not even a pressure gauge on the schrader inflator.